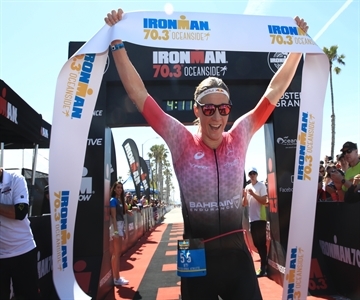 Ben Kanute (USA) and Daniela Ryf (CHE) battled an impressive field of triathletes to win the 2019 IRONMAN® 70.3® Oceanside triathlon. Kanute narrowly edged the rest of the field to earn the overall victory with a time 3:49:25. Ryf produced another signature dominating performance, setting a new course best with a time of 4:09:19 (breaking Anne Haug’s time of 4:12:03 from the previous year) in her debut performance on U.S. soil outside of the IRONMAN and IRONMAN 70.3 World Championship events. Rodolphe Von Berg (USA) placed second trailing Kanute by only 12 seconds with a time of 3:49:37 and Adam Bowden (GBR) rounded out the men’s podium in third with a time of 3:53:53. Holly Lawrence (GBR) battled her way to a second place finish in the women’s field with a time of 4:14:06 followed by Ellie Salthouse (AUS) who finished in third with a time of 4:16:41. The 2019 IRONMAN 70.3 Oceanside triathlon saw more than 2,600 athletes representing 33 countries, regions and territories and 47 states start the race. Competitors ranged in age from 18–80 years old. One of more than 100 events in the global IRONMAN 70.3 Series, the 2019 IRONMAN 70.3 Oceanside triathlon led athletes along a 1.2-mile swim, 56-mile bike and 13.1-mile run throughout Oceanside, Calif. and its surrounding areas. Athletes began their day for the first time with a beach swim start taking athletes through the surf, then heading north and into the Oceanside Harbor. Once out of the water, participants embarked upon a single-loop bike course that ventured through Camp Pendleton and San Onofre Bluffs State Park. Athletes experienced rolling hills prior to San Mateo hill followed by two more hills only to come upon a flat but windy road back to the Oceanside Harbor. The double-loop run course wound along the Oceanside Pier and then out to Oceanside’s flat beachfront path known as “The Strand,” where miles of sandy beaches provide beautiful views. Offering a professional prize purse of $50,000 USD, the race also awarded a total of 40 qualifying slots to the 2019 IRONMAN 70.3 World Championship in Nice, France.